Brown University is an Ivy League School and its admissions statistics fall in the middle of all Ivy League Schools. 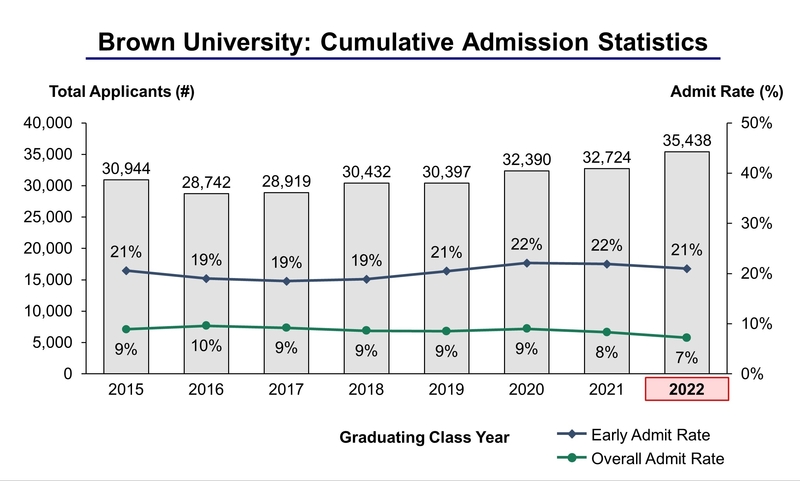 Similar to the trends across all top schools, Brown University acceptance rates have continued to decline over the past 8 years and will almost certainly continue to do so into the future. The Class of 2022 was the single most challenging year to be admitted to Brown University ever. For the Class of 2022, 35,438 students applied to Brown University of which 2,566 students were accepted, yielding an overall acceptance rate of 7.2%. Overall applications increased by 8.3% over last year (2021 to 2022) from 32,724 to 35,438. For the Class of 2022, 737 students were admitted through the early admissions process. Total early applications totaled 3,502, yielding an early acceptance rate of 21%. Early applications increased by 10.5% over last year (2021 to 2022) from 3,170 to 3,502. Brown University has one of the most generous student financial aid programs in the world. Approximately 46% of current Brown University students are receiving some amount of financial aid. What this statistic also tells us is that approximately 54% of Brown students come from families likely in the top tax brackets, with families earning a minimum of $250,000 in annual household income. For the recently admitted Class of 2018, an even higher 67% of students applied for financial aid. In the U.S. today, the percentage of households with this level of income or above is approximately 4%. Therefore, we can conclude that on the whole, students in Ivy League schools are ~25 times more likely to come from households with a minimum of $250,000 in annual household income compared with students in the U.S. population at large. What this means is that although the Ivy League is becoming more and more accessible to lower income families, it is still ~50% comprised of students from the wealthiest households in the U.S. and abroad. It is no surprise that students from these wealthy families end up in the Ivy League and other highly selective schools. These students are groomed from an early age and have access to tremendous resources including standardized test preparation courses, unique internship/research opportunities and access to college admission strategy consulting firms such as Ivy League Prep to give them the “edge” needed to gain admission to these highly selective schools and surpass the competition. Brown University is the nation’s seventh oldest institution of higher education and the third oldest in New England. As a liberal arts university, its education offered encourages leading-edge scholarship, research, and opportunities for community-based service learning. Brown University is most known for its unconventional curriculum designed to encourage students to pursue their passion without fear of punishment for exploring the wrong path. The university offers more than 6,000 students the ability to design their own studies, with almost eighty concentrations in forty-four different academic areas, as well as an opportunity for independent study. Some of Brown’s strongest and most popular programs include Biology/ Biological Sciences, History, Economics; English, Political Science, and International Relations and Affairs. The university also offers 37 Division I sports teams, with standout programs including the men’s and women’s rowing teams, men’s soccer, football and equestrian. Brown University’s graduates earn some of the highest salaries in the country. The university is currently ranked in a tie for eighth place as one of the institutions with the highest paid graduates, more than a third of who accept business and management positions in Corporate America. Brown was also ranked third in the Princeton Review’s list of America’s Happiest College Students in 2012.